Rome/Italy (2018) – There are some mandatory stops one has to take when visiting Rome. 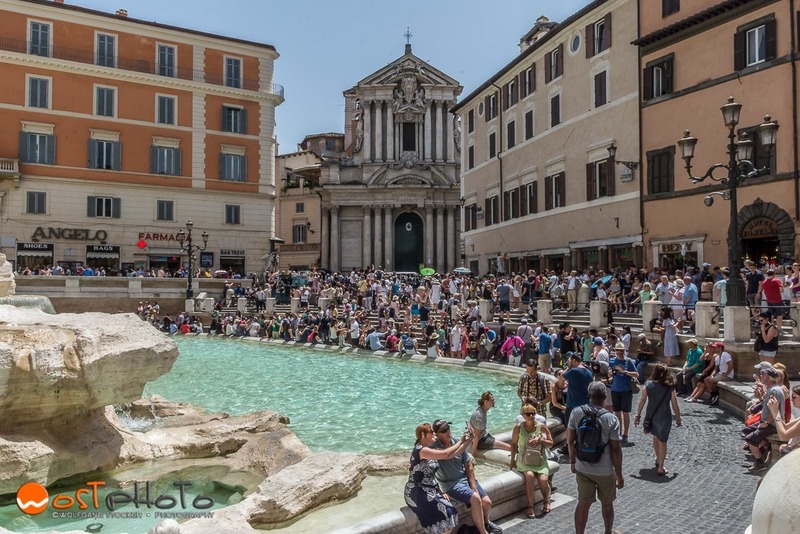 One of the "must-see"-landmarks is Rome's most beautiful and largest Baroque fountain, located in the Trevi district, in between the Piazza del Popolo and the Colosseum. Even though Rome has the most fountains in the world (more than 2.000) this one is very special. Remember Federico Fellini's (Italian film director, 1920 - 1993) "La dolce vita" from the Sixties, in which the Swedish actress Anita Eckberg jumped fully dressed into a fountain? Yes, it was the "Fontana di Trevi", Rome's Trevi fountain, which became after the release of this movie worldwide even a bit more famous. But don't get any ideas, it's strictly forbidden to step into the water. Also, even though it might seem refreshing, it's recycled water and not drinkable. No wonder Hollywood used this magnificent monument as a backdrop in many movies – La Dolce Vita, Three Coins in the Fountain and Roman Holiday, to name a few – the Trevi Fountain is one of the stars of the Roman sights. If you throw a coin into the fountain, you will come back to Rome, if you throw two coins you will find a new romance in Rome and if you even throw three you will get married. so the legend says and supposedly it works only with the Trevi fountain, so don't get your coins and run for a fountain, you will have to travel to Rome first. If you do it, do it right: throw the coin with your right hand over your left shoulder. Guess how many coins are thrown into the fountain every day? The value of astonishing 3.000 Euro! In 2016 the total amount of money thrown into the Trevi Fountain for this year was 1.4 million Euros! I know what you are thinking. By the way: The coins are collected every night and given to an Italian charity program which uses the money to help Rome's needy to buy groceries. Oh, and be aware, it is a crime to "fish out" and steal coins. 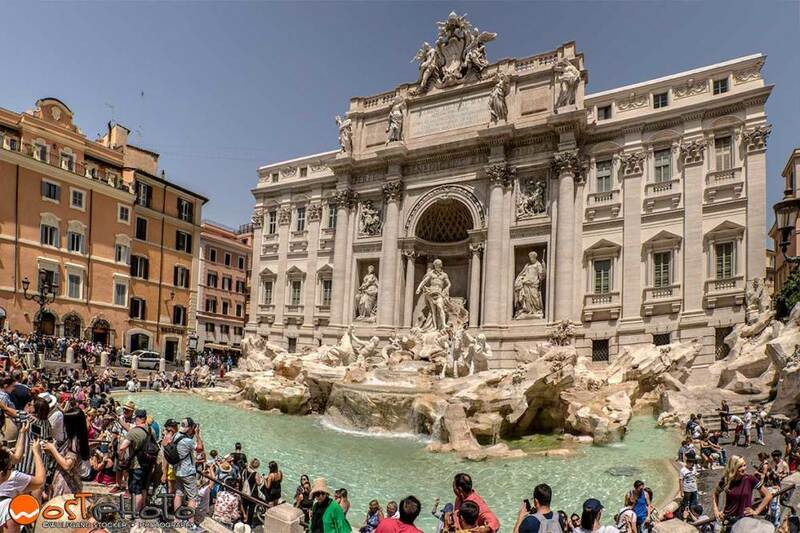 The Trevi Fountain was renovated in 2014/15 for 2 Million Euro and since then shines even more. Visiting Assisi – "Oh, when the Saints..."
Donkeys run for Gold in "San Siro di Friuli" "Corse dai mus" – Spectacle in Fagagna"
Passariano/Codroipo, Villa Manin/Italy (2017) – ​The "Villa Manin" in Passariano/Codroipo has already something noble about it. But add some very strong and elegant horses pulling vintage carriages to the former property of one of the last doges of Venice and let people in traditional and historic clothing guide them through an obstacle course right on the Manin's former front lawn and you have the perfect picture of this year's "5th International Competition of Tradition Attacks" in Friuli. Abbey Monte Oliveto Maggiore, Tuscany/Italy (2017) – Where the green rolling hills of the Tuscan landscape all of the sudden end and the rather harsh looking land of the Crete Senesi takes over, there you'll find Tuscany's most-visited abbey, the Abbazia di Monte Oliveto Maggiore. With that you meet the brotherhood of the Monaci Benedettini di Santa Maria di Monte Oliveto and my new found friend Brother Joseph. The monastery is renowned for its great Renaissance frescoes in the "Chiostro Grande"
Lots of ancient charm in Montichiello – "Terrazza della Val' Orica"
Montepulciano, Tuscany/Italy (2017) – I had a close relationship with Montepulciano long before I ever saw this beautiful and picturesque medieval town. Well let's be honest, my relationship was more with the town's name, "Montepulciano" than with the city itself. It just sounds so special when you say it:"Mon-te-pul-cia-no". Try it! It's like Ferrari, Mont Blanc or Manhattan. Some words just have something royal to it. Montepulciano I used mainly in connection with the wine card in restaurants. Venice/Italy (2017) – ​In times like these, when the daily amount of information we consume leads to brain numbness, ART somehow is still able to reach us. And with that every information transported with it. The internationally renowned Italian artist Lorenzo Quinn, son of the famous Mexican-American actor Anthony Quinn († 2001), used his newest monumental sculpture "SUPPORT" to do just that. He used his amazing installation to transport a very powerful message concerning climate change. Basiliano, Vissandone, Feletto/Italy (2017) – On Epiphany's Eve, the evening of the Three Holy Kings, the Befana, a witch on a broomstick, "flies" from house to house to deliver gifts to the children. In the evening hours there is everywhere smoke to smell in the region. It's the time of the Pignarul. Huge bonfires are started all over this part of the country, burning big hay piles and of course the witch. First at the beach and then on safari – Lion Country Safari" in West Palm Beach"
Villa Mainardis – Movie location for "The Best Offer"
Hallstatt/Austria (2010). – I still remember my very first visit in Hallstatt, the little old village at the lake which carries the village's name, the Hallstaettersee. It was during my school years and I was in my teens. The town where I went to school is not even 10 miles from Hallstatt. I made many trips to Hallstatt, especially in summer when swimming in the lake with my friends was so much more than just refreshing. Genoa/Italy (2012) – The bigger the choice, the harder it is to choose. Something photographers know all too well, especially when it comes to pick a city for the next photo trip. In Italy I find it particularly difficult to prioritize due to the many beautiful cities available like Rome, Florence, Naples, Venice, Milan or Pisa, to name only a few. And there are so many more, each well worth the trip. Genoa for example. The home town of Christopher Columbus should be on everybody's bucket list. Porto Venere/Italy (2012) – There are many spectacular seaside villages at the "Gulf of the Poets" at the Italian Riviera. Some are very famous and worldwide known while others still are considered sort of second-rate. Porto Venere is one of them, the small but very picturesque town in the Ligurian region lives and profits mostly of the tourist's interest for the incredible Cinque Terre, the nearby string of five coastal villages Riomaggiore, Corniglia, Vernazza, Manarola and Monterosso. digital images and text may NOT be used for personal or commercial use WITHOUT explicit written permission from the artist.